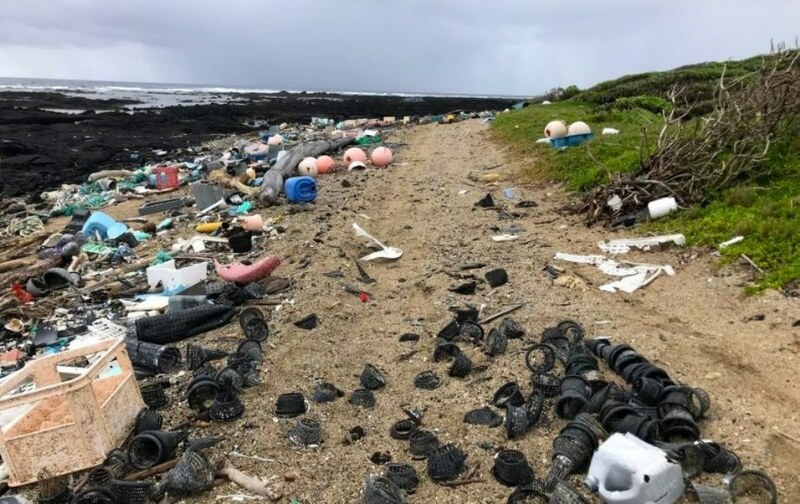 Scientists at the University of Hawai‘i at Mānoa School of Ocean and Earth Science and Technology (SOEST) have recently discovered that degradation of common plastics in the environment releases several greenhouse gases. It was almost 70 years ago when mass production of plastics was started, and now the production rate is anticipated to increase by twofold over the next 20 years. Although plastics are used in a wide range of applications because of their stability, durability, and low cost, they also have detrimental effects on the environment. As plastics degrade, they emit a range of chemicals—some of which have a deleterious effect on ecosystems and organisms. The study, reported in PLOS ONE, reveals the universal production of methane and ethylene—greenhouse gases—emitted by the most common plastics upon exposure to sunlight. Materials like acrylic, polycarbonate, polypropylene, polystyrene, polyethylene terephthalate, low-density polyethylene (LDPE), and high-density polyethylene were tested by the science team. These materials are used for making construction materials, textiles, food storage, and many different plastic goods. However, the most widely produced and discarded synthetic polymer in the world is polyethylene. Used in shopping bags, this polymer was discovered to be the most prolific emitter of methane and ethylene. The researchers also discovered that during a 212-day experiment, virgin pellets of LDPE emitted increased greenhouse gases, and when LDPE debris found in the ocean were exposed to sunlight, they also released a considerable amount of greenhouse gases. Once the emission of these gases is started by solar radiation, it continued in the dark. Moreover, it is known that smaller particles, called ‘microplastics,’ are ultimately created in the environment which could further speed up the production of gas. Greenhouse gases have a direct effect on climate change—impacting global temperatures, sea level, health of the ecosystem in the ocean and on land, and storms, which increase drought, flooding, and erosion. “Considering the amounts of plastic washing ashore on our coastlines and the amount of plastic exposed to ambient conditions, our finding provides further evidence that we need to stop plastic production at the source, especially single use plastic,” said Royer. In order to limit the overall emissions of greenhouse gases from plastics, Royer is currently working to devise estimates of the amount of plastic that is exposed to the environment in terrestrial and oceanic regions, worldwide.